Most Rev. Dr. Margaret E. Benson-Idahosa is wife of the late Archbishop of Church of God Mission International, Most Rev Prof. Benson Idahosa and currently the Archbishop of the ministry with several branches and hundreds of thousand of members worldwide. She also pastors the 5,000 capacity Faith Miracle Center Church, where multiple services are held weekly. Dr. Margaret Benson – Idahosa was born on the 29th of July, 1943, into the royal lineage of the Benin Kingdom. 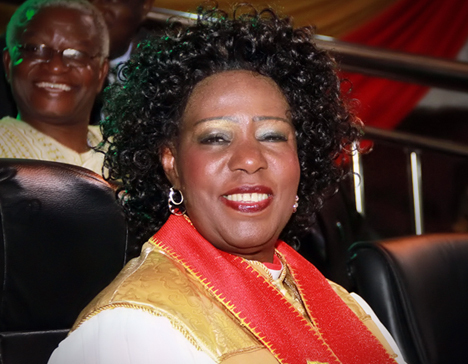 She was ordained into the ministry on the 24th of May, 1983 and consecrated Bishop on the 5th of April, 1998. This position makes her first female Pentecostal Bishop of a ministry of this magnitude in Africa. Together with her husband, she has preached the gospel of Jesus Christ in more than 140 nations covering the entire continents of the world. She is not just a woman preacher; she doubles as a father and mother to many spiritual children all over the world. Her vision and mission is to “reach the un-reached” irrespective of their location whether in the desert or riverine creeks. Since her consecration as Bishop, she has frequently traveled to America, Europe and parts of Africa and in communities far-flung from major towns and cities preaching, teaching and healing the sick. She is also the Vice President of the International Communion of Charismatic Churches (ICCC), the Chancellor/Visitor of Benson Idahosa University (BIU), General Overseer, Idahosa World Outreach (IWO) and the President of Christian Women Fellowship International (CWFI). Dr. Margaret Benson-Idahosa’s love for children and strong belief that they be trained and raised properly saw to the establishment of the Word of Faith Group of Schools, which now has more than one hundred- eight (108) branches all over Nigeria. She also has to her credit an orphanage for abandoned babies. Three of these children have been adopted into the Idahosa family. Dr. Margaret Benson-Idahosa is a mother of four biological children – Feb, Ruth, Daisy and Freda and three adopted children Precillia, Osagie and Osasu. She is a grandmother to seven.